My First outfit post in forever. I feel like getting this post done was a big accomplishment. I honesty don't know how we were able to get these pictures done. Yesterday I got locked out of the house with the two kids. Our garage door broke and I didn't have a key. Long story short Matt had to come home to let us in. So since he was home we thought we would attempt to shoot an outfit. So we loaded up both kids in the car. Well, as soon as we did it started thundering and the sky was really dark. But we were determined. So we drove in the opposite direction of the storm. Found a decent location, unloaded the kids and tried to get the pictures done before it started pouring. It was actually pretty funny. Andi was running around like crazy, Lincoln was in the stroller and Matt and I were just trying to get a couple of pictures. It was crazy and I am surprised we got a couple of good ones. And less than 10 minutes later we were back in the car! Normally shooting an outfit is kind of a process and takes at least 15 minutes sometimes more just depending on different things. And I am a little OCD about the pictures so I always make it take longer. But with two kids there is not much time for that. So these pictures might not be the best that we have ever done. But thats ok. I am just happy to have a post up. This is my life and I wouldn't have it any other way. I love this striped t-shirt. And for $19 you can't beat it. I also got it in the solid white. It is just a great basic to have in my closet. 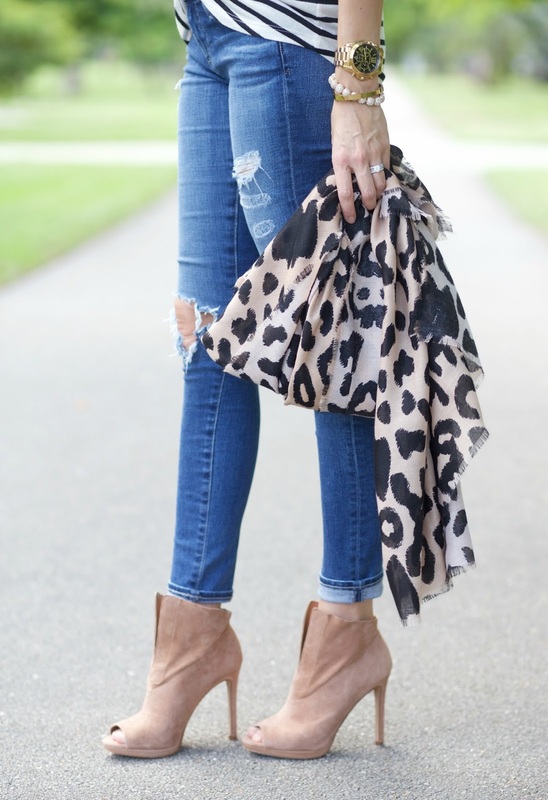 I don't know why this leopard scarf isn't online but I found a few others that I love. 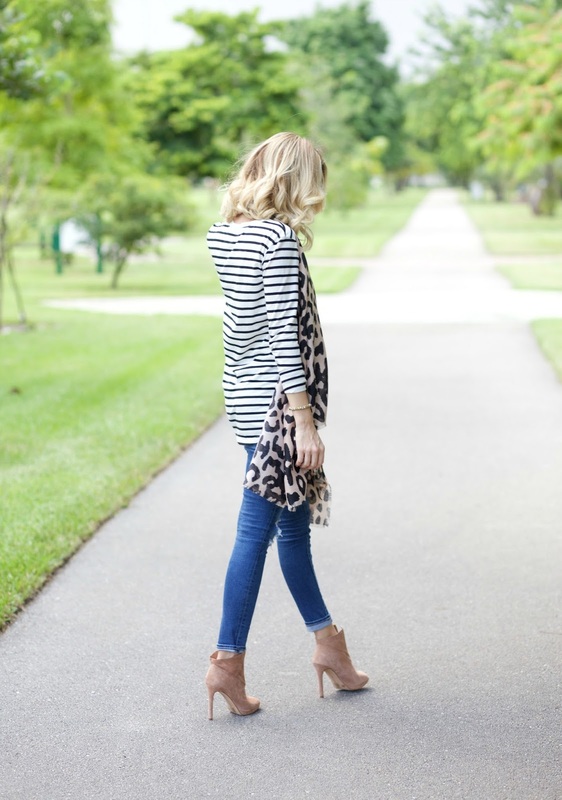 A leopard scarf is a Fall staple in my opinion. And last but not least these booties are seriously perfect. There are just so many good pairs of open toe booties this year. These come in 3 colors and they might be my favorite pair so far! Also, the Tory Burch Fall sale starts today! This is such a good sale. When you spend $250 you will get 30% off of your purchase! Just enter code FALL16 at checkout. I linked my favorites below. It is such a great time to get some great Fall items. I have two pairs of boots and they are my favorite. Happy shopping. Thank you all so much for reading and for all of your sweet comments from Mondays post. It means so much! Glad to see you post here, I've been missing your blogging and usual outfit posts! You're looking as charming and stylish as always! I think these pictures look great!! And happy to see you getting to post again! You look so stylish!! I feel like shooting outfit posts never gets easier, especially if you're shooting alone. What a good hubby! I love the scarf, by the way, so chic. Love the scarf! Super chic. Love the Outfit, those boots specially. Props to you for getting these pics done so fast .. with a storm on the way! .. and with 2 kids! Super mom! I love the stripes with the cheetah print so cute! !